Life seems to be in fast forward these days. I can hardly keep up! My program still hasn’t disbursed my loan (several weeks into classes…thanks), so I’ve been scavenging dishes from my pantry. Luckily the Grandin Farmers Market is super affordable (the four peaches I scored which made up the salsa from last week and the compote this week cost only $2), so I have lots of fresh goodness to mix in with the various beans and grains. Right now I’m living off of Heidi’s Rustic Cabbage Soup which I blogged about back in February (it probably only cost $3 or $4 total to make, woohoo!) and tonight I made Renea’s Spaghetti Bolognese which, wow, is super tasty and uber filling. I’m pretty sure meat eaters would love the tvp/bulgur awesomeness of it! But back to the brunch. Saturday or Sunday morning, something to read, pancakes and peaches, bottomless mugs of coffee–it’s my version of heaven. And when the peaches are a deep, purple color, what’s more to love? Although I felt a little dirty, a Georgia girl buying peaches in Virginia, the sweet, peachy peaches were the perfect addition to my weekly weekend brunch ritual. Paired with cornmeal pancakes that tasted like buttery slabs of cornbread (a good good thing in my mind), the peaches truly shone. I’m lucky, living in this farm-rich corner of the country. So many good folk, so much good food, and a sun that always seems to shine. In a glass liquid measuring cup, mix together the soy milk and apple cider vinegar. Set aside for 10 minutes to curdle. In a large mixing bowl, combine the cornmeal, flour, sugar, baking powder, baking soda, and salt. Mix in the soy milk and vegetable oil and stir until well combined. Heat a skillet over medium heat. Lightly oil the skillet. Pour the batter in 1/4 incriments into skillet, spaced several inches apart (I can fit 3 pancakes in my cast iron skillet). Cook until the bottoms are slightly browned and the top is bubbling. Flip over. Cook until golden brown. In a medium sauce pan, combine the peach slices, sugar, and water. Bring to a boil, then lower the heat to a simmer. Simmer for 10-15 minutes, until the liquid has reduced to a thick syrup. Serves 3-4 depending on how greedy you are. that stinks that they still don’t have things rolling with your loan. so frustrating! i’m glad the farmer’s market eatz are cheap & that you’ve got some pantry goods to work with. i’ll fo ‘sho have to check out the bolognese, and i’m going to try the cormeal pancakes, too. they look like the yummiest way to start your day. mmmmmmmmm! 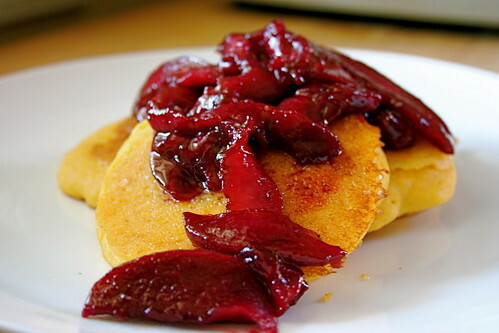 Oh my gosh that looks super delicious, I want pancakes with plum compote right now! Those peaches look awesome. I shall try this recipe the next time Fortinbras spends the night here and demands pancakes in the morning; I think he’ll love it. This looks great! Those peaches look awesome. The color is so rich, almost like a beet! Wow! I’ve never thought of making pancakes with cornmeal before. It’s brilliant! I’m gonna try this! Beautiful stuff! I have made a list of items from my pantry I need to use up and cornmeal was on it. I’m definitely trying your pancakes, thank you for the recipe. The compote is also a great idea. I love peaches so much. Wow, I’m not a big pancake fan but those look really good. I love cornmeal… especially in corn bread and polenta (your polenta looks great, too, btw). I don’t have a big sweet tooth, so I think I might try a savory version of these, skipping the sugar, and maybe adding some corn kernels to the batter. You’ve inspired me! Sounds delicious! I hope they release your loans soon (I’m with you – my university makes me sign the checks, and then they cash them and account for them or whatnot, and get back to me with any left-over in a couple of weeks). At least you have a decent pantry, though! Mmmm. I love cornmeal pancakes! The peach topping sounds like a really delicious addition, as well. I love cornmeal pancakes! I can’t wait to make these this weekend — beautiful.